I feel sometimes hair is one of the most overlooked areas of the body. Ever come across people who ignore their hair probably because they have been blessed with some of the most desirable lustrous hair? I do and they care very little about their hair. Another category (I would be one among them) really lay their hands on whatever they can and try on whatever can help to boost the hair growth. Improper diet – you won’t find it in any saloon. It’s something you need to implement yourself. One of the first and foremost reasons why people are losing hair is due to incorrect food consumption. Junk/fried foods often disrupt the body’s natural process and let’s face it, you are not getting any nutrition from fried foods. For healthy hair, foods that include iron, protein, vitamin E, minerals etc. are best recommended. Healthy hair foods can really put a positive spin on your hair by giving its natural color, strength and a healthy look. Stress – Do you know that a normal head contains around 120,000 to 150,000 hair strands. Though this may seem too much, imagine losing at least hundreds every month. Now here comes the point where we need to worry. Number two on the list of hair loss is stress which people undergo. Dr. Paradi Mirmirani, Dermatologist of the Permanente Medical Group in Velljo, California says that it all comes to the stress that you are dealing with. For instance, too much workload or being late to work is not going to affect your hair in any way. Often, sleep deprivation or changes in food/appetite can play with the stress hormones. Genes – now this is for the guys. Unfortunately, genes can play an important role in losing hair you have. The fact remains that a male would be getting the X chromosome from his mother which has been transferred from her daddy. So if your grandpa has a clean head, chances are you might lose some hair too. Menopause – many women who are going through menopause stage often undergo various symptoms and loss of hair is one among them. It is because of the hormonal changes that you are undergoing which can raise the changes in them. Of course, treatments are widely available such as minoxidil solution, plasma injections, off-label finasteride (that is designed specially for menopausal women) etc. Medication – yes, medicines can be one of the reasons you are losing your precious strands. If you are taking medications for antidepressants, cholesterol, acne, high blood pressure, epilepsy, Parkinson’s, weight loss drugs, etc., you have a very good chance of losing hair. Even people who are undergoing chemotherapy sadly will lose hair to a good amount. Hairmax Laser Comb Reviews says how this new and advanced Hair Loss / Hair Growth Laser treatment actually works. 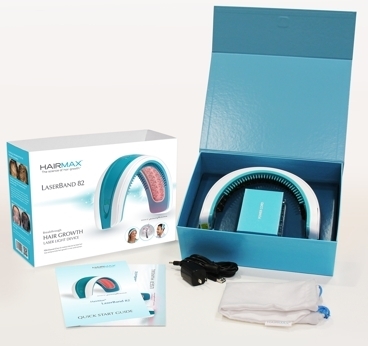 Hairmax Laser Comb carries energy to the cells on the scalp that thickens existing hair and promotes hair growth too. Now that you have a clearer perspective of the reasons that might trigger hair loss, don’t you think its time to mend it. Now I know, you might have tried lot of over the counter products or probably undergoing treatments in saloon that promise you guaranteed hair growth for some hefty bucks. You may have notice some results but for a price. So why not try some home remedies which are nothing but healthy hair foods that will neither burn a hole in your pocket nor give you any side effects (that usually happens during medication). Here are few natural remedies for strong and healthy hair. 1. Go Bananas – you may have eaten up bananas. Now its time to apply them to your hair. Top on the list of healthy hair growing foods are man’s second food [first, being the forbidden apple]… ;). Yes, believe it or not applying bananas onto your hair can fasten the hair growth. Bananas contain high level of potassium that can improve hair’s elasticity and increase the health of your hair. Simply mash a banana in a bowl, apply it from root to tip and leave it for 15 minutes. Wash it with shampoo. This is one of the best remedies for curing dry and damaged hair. 2. Yellow Egg yolk – Condition your hair by simply applying the egg yolk or take three egg yolks and mix them with a tbsp of olive oil and three drops of vitamin E. Choose either of the one and apply on your scalp. Leave them for 10-15 minutes and rinse it off. Doing this at least once a week will soften your hair. 3. Grab a Beer – it is one of the popularly used remedy for getting a shiny hair. Many people rinse hair with beer, However, you can also opt by spraying your hair by beer. Simply pour beer in a spray bottle. After washing your hair and drying (towel not hair dryer), simply spray beer lightly onto your hair which can give you instant shine. 4. Mayonnaise – Looking for a healthy hair food? Grab some mayonnaise and apply on your wet hair. It is one of the best conditioners you can find. Rinse after keeping it for 15 minutes- 1 hour for a conditioned hair. 5. Oil massage – a very popular remedy in India for growing healthy hair, oil massage, often called as ‘Champi’ (in Hindi, meaning massage) can really aid in strengthening the hair and growing long hair. Coconut oil is considered one of the best healthy hair foods in India and actually tops the most used product for hair growth be it internally or applying externally. Take warm coconut oil or olive oil and leave it for an hour after massaging your head equally. If you want to get rid of dandruff, simply mix lime juice and vinegar, apply it and keep for 10-15 minutes. 6. Olive oil – Are you dealing with hair fall or breakage? Olive oil is one of the best remedy after coconut oil that helps in preventing hair fall. Take four tbsp of olive oil and leave it for half an hour. Rinse away thoroughly. For best results, you can leave it overnight. This will not only help in nourishing the hair but also giving it an additional conditioning. 7. Garlic – Not many know that garlic oil can work for your hair. All you have to do is boil few garlic cloves in olive and coconut oil. Massage to your hair and leave it for sometime. You will notice the results within a few days. Using garlic oil will not only produce new hair but also promote blood circulation to the scalp. 8. Amla powder and Lime Juice – combine a tbsp of amla powder (Indian Gooseberry) with a juice squeezed from one lemon and shake till its dissolved. Now let the powder dissolve and massage the mix to the hair roots, scalp etc. Leave it for 20 minutes and rinse it away for a stronger and thicker hair. 9. Strawberries – another on the list of healthy hair growing foods is strawberries that can condition your hair. Mash approx. eight strawberries with a tbsp of mayonnaise. Massage it to washed hair, cover it with a shower cap and then with a warm towel. Keep it for some time and wash it away with shampoo. No need for conditioner as the strawberries will leave your hair conditioned. 10. Green curry leaves – Grey hair is not a problem anymore. Before massaging hair oil to your hair, add the curry leaves to coconut oil and let it fry completely. This will help in delivering long hair thereby preventing grey strands too. As mentioned above, indulging in healthy diet, regular exercise and de-stressing yourself are some of the points that needs to be taken care of. Here are some of healthy hair growing foods that will help you boost your hair internally. Everything in moderate is good and when you have these foods in the right amount, the benefits are immense. Walnuts – contain oils that contribute to hair growth and the maintain the elastin in the hair. Lack of elastin can cause your hair to snap. Spinach – for rapid hair growth, consume lots of spinach. Spinach is high in minerals and vitamins such as folate, vitamin C that can maintain the hair follicles and retain the natural oils in the scalp. Carrot – rich in beta carotene, when ingested in our body gets converted to vitamin A that helps the scalp in producing natural oils from the body. Greek Yogurt – contains rich versions of vitamin B5 and vitamin D that have been indefinitely linked with the growth of hair and follicle health. Eggs – great for your hair, it is used in all the DIY hair growing tips. Eggs are rich sources of vitamins especially vitamin D that can aid if you want to grow long hair. Have you ever wondered what damages you hair? Sometimes we are too callous to our hair and overestimate them. Just be vigilant to even the smallest of things and you will notice what I am mentioning here is something you must already be doing. Picture what your hair goes through when you are in dry weather, rough winds, combing on wet hair or even forgetting to wear a cap on hot summer etc. Of course, you can’t control the weather but that doesn’t mean you can’t take steps to inhibit hairfall or thinning of hair. Here are some of the things that can ruin your hair. Do not wash your hair often. Yes, believe it or not washing your hair often can swell up the shaft and shampoos only add to the concern as they will remove the oil that is produced by your hair naturally. This makes your hair easily prone to breakage resulting in making your hair look dull and withered. Its okay to limit your hair wash. Use a mild shampoo that will not hinder hair growth. Stay away from shampoos that come with labels such as ‘deep cleansing’. We all have been hearing it since young age. Do not brush or comb wet hair. The point stands valid and always will (of course, until you go bald). The reason is because wet hair is more elastic and has the tendency to break easily. Its always better to use fingers to scroll through your hair for removing tangles. Even towel drying is not good for your hair. The reason is rubbing your hair can make your hair look frizzed up and rough the outer layer of the hair (cuticle). The best way is to use an absorbent towel and blot it. I don’t want to tell you to stop using blow dryer because you are very well aware of it, but still you continue to do so. When you blow dry, it removes the moisture not only from the surface but also the inner scalp which can make your hair dehydrated. The result is pathetic – your hair appears lifeless and brittle. Lastly curling irons or straightening irons obviously work differently than blow dryers because the damage is much higher than what you expect. Using hot irons on your hair can crack the cuticles which will lead to hair loss. Another thing to note is using hot irons on wet hair can provoke little steam burst out due to the moisture of water in the hair. This can lead to hair breakage or split ends. Though it is best not to use, you can use conditioners that contain cetrimonium chloride. This will increase the strength of your hair making it too tough to break. Bottomline, be gentle on your hair as it is a part of you. Staying away from chemicals as far as possible and incorporating natural remedies apart from a healthy diet is essential for your hair. Feed your hair with healthy foods both internally and externally by ingesting the right products in your body. Nature has been kind and gifted us with bountiful resources that can utilized freely. It all comes down to you on how determined you are to make this change in your life.